This facial mist is perhaps the most intuitive skincare product in our repertoire. As a highly vibrant botanical face toner and energy clearing mist. 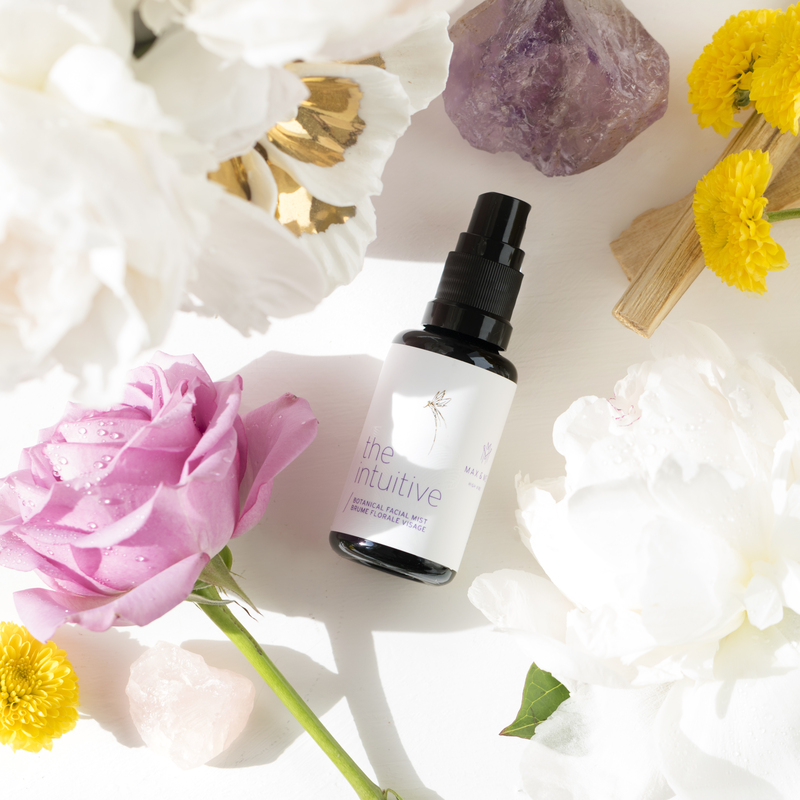 The Intuitive supports your physical and energetic layers to deliver calming, balancing energy with skin-rejuvenating properties. Comprised of a beautiful ingredient blend featuring wild agonis, which helps to balance circadian rhythms while the infusion of blue tansy, neroli, calendula, rose, myrtle and yarrow bring tranquility to skin and senses. 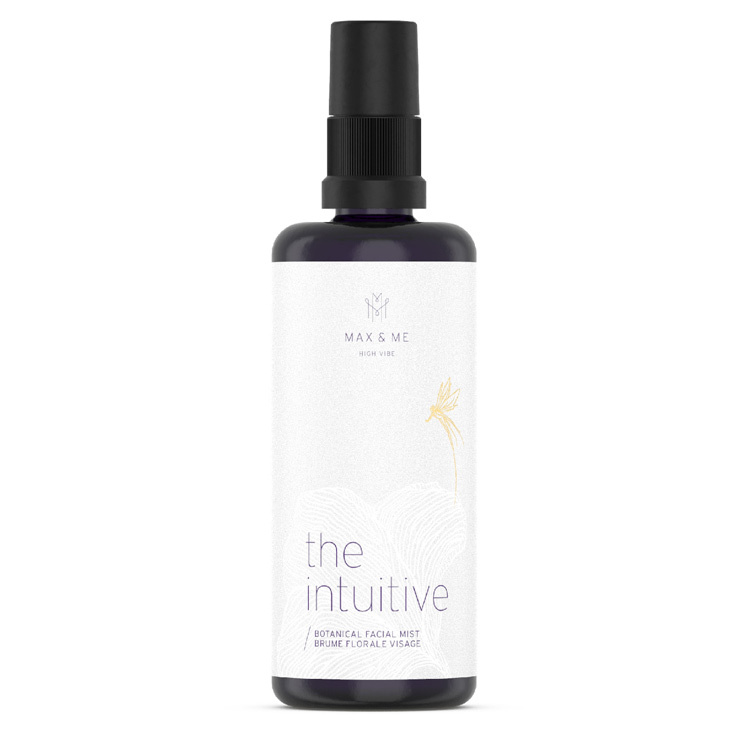 As a high vibration hydrosol blend, The Intuitive can be used as a daily toner, aura cleansing mist, pillow spray and as a part of your daily meditation ritual. Mist onto clean skin prior to applying serum or facial oil for a feeling of softness. May also be used to moisten clay masks or to make a cleansing emulsion with your favorite facial balm. Mist onto the body for a feeling of cooling freshness and use as a room spray for delightful scent. Achillea Millefolium (Yarrow) Flower Water*, Bursera Graveolens (Palo Santo) Flower Water**, Citrus Aurantium (Neroli) Flower Water*, Myrtus Communis (Myrtle) Flower Water*, Hamamelis Virgiania (Witch Hazel) Flower Water*, Rosa Damascena Flower (Rose) Water*, Calendula Officinalis Flower (Calendula) Extract*, Olea Europaea (Olive) Fruit Oil*, Lactobacillus Ferment, Rosa Canina (Rosehip) Fruit Oil*, Sclerocarya Birrea Kernel (Marula) Oil**, Bursera Graveolens (Palo Santo) Oil**, Citrus Aurantium Flower (Neroli) Extract* Hyssopus Officinalis Decumbens Hyssop)*** , Citrus Reticulata (Green Mandarin) Flower Extract*, Styrax Tonkinensis (Siam Benzoin) Oil*, Helichrysum Italicum (Immortelle) Flower Oil*, Agonis Fragrans (Agonis) Oil** , Tanacetum Anuum (Blue Tansy) Oil***. Max & Me products are always an experience. The Intuitive is no different. The scent is earthy and natural. The mister is super fine (what a dream). The Intuitive mixed nicely with my other skincare and my skin drank it in. This is a mist that makes one's skincare regime a true moment in time. I agree with the reviewer above! I wish it weren't so expensive - I would buy this all the time. I belong to the monthly beauty box club. This came as part of that so it was deeply discounted. I want to spray my face with this stuff morning noon and night! It's too expensive to use it that much, so really what's the point of having it? I seem to be "saving" what little I have left. I mean, if ya can't put it on without worrying about how expensive it is and when you're going to run out.... It does smell heavenly, and it makes your face so soft. I like to spritz it on my face before applying moisturizer. If you're going to splurge on a toner this is the one to do it with! Ok, so admittedly when I read the pamphlet that came with the monthly Beauty Heroes box, specifically max and me’s notes about the whole higher vibration component in the products formulated, I rolled my eyes. I’m sure it’s a mist just like any others out there, I thought. Then I tried it. I wasn’t initially impressed with the smell as it seemed faint, floral, and a bit watered down. The fragrance then, oddly enough, evolved as it settled. It then smelled more earthy with a tinge of spice. It was distractingly pleasant and as silly as it may sound, there was something about that fragrance that resonated with me and gave me pause. Whether it was that whole vibrations deal or simply a sensory attachment to some pleasant memory, who knows. Whatever the case, I’m spritzing my face about four times a day and having to stop myself from spritzing my face every time I go past my bathroom cabinets as this is not a cheap product to restock. Seriously, this is a great mist. My skin feels soft and there is something about the aroma that gives me pause every time I put it on. I adore this mist, says the person who is generally otherwise ambivalent about mists.